Interior door handle Hoppe aluminium Detroit series on square rose. The Detroit handle produced by Hoppe is very easy to grip it. Easy grip for children, the elderly and people with physical disabilities. Particular it is the handgrip that it is curved on the "tail". 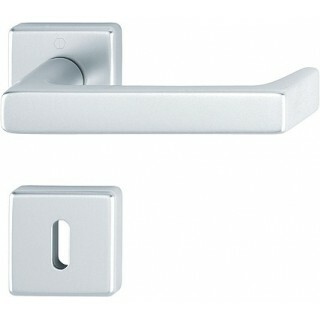 The structure is made in stainless steel with precise and durable return spring. The assembly is made by the new patent Hoppe: quick-fit connection that allows the installation in a short time even for less experienced hands. We will be shipped packaged with mounting accessories included.